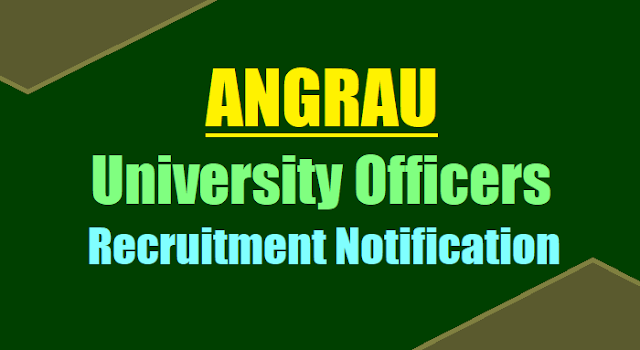 ANGRAU University Officers, Dean, Director, Registrar, Librarian Posts Recruitment 2017, Last date to apply is 06.11.2017. Acharya N.G. Ranga Agricultural University, Guntur invites applications for the following vacancies. Advt. No.6/RC/2017, Dated:15-10-2017 :: In continuation of the notification issued vide Advt.No.4/RC/2016, dt.23.09.2016, the following posts are re-notified to invite applications from those who become eligible subsequently. The candidates who applied already need not apply again to the same posts. They can apply to the other posts for which they are eligible and if they have not applied to them earlier. Applications are also invited to the following posts additionally. The filled in application along with DD should reach the University on or before 06.11.2017 by 4.00 PM. The details on qualifications, experience, other requirements, conditions for the above posts can be seen in subsequent pages. Qualification: Degree, PG, Ph.D (Relevant discipline)with experience. 1. The University reserves the right not to fill up all or any of the posts advertised. 2. A candidate can apply for any number of posts to which they are eligible. Separate application form should be submitted for each post. 3. The discipline to which the Ph.D degree belongs to shall be decided based on the research work carried out by the candidate for his/her degree. 4. For reckoning the required experience for the post, the experience in the concerned subject or disciplines in Teaching or Extension or Research shall only be considered as relevant experience. 5. Certified copies of degree or provisional certificates and marks sheet / transcripts should be enclosed to the application. The originals should be brought at the time of interview. i) Under items No.15 & 16 (Meant for details of qualifications) the period of studies should be indicated clearly with date, month and year of joining and leaving studies. If any of the applicants did their M.Sc. or Ph.D. by research, it should be clearly indicated. ii) Under item No. 17 (meant for employment record) the applicant should furnish the details of service rendered by the applicant in different cadres (i.e.) clearly, with date, month and year of appointment and scale of pay and pay drawn and also should indicate awarding of CAS/MERIT PROMOTIONS particulars clearly. The period of study during the service should be indicated clearly. iii) Service rendered outside ANGRAU, if any, should be clearly indicated duly certified by the competent authority. iv) Submit 5 sets of application along with 10 best Research Publications and other educational within the prescribed date. 7. Applicants working outside ANGRAU should send their applications through proper channel so as to reach the University within the prescribed date. 8. The in-service candidates of ANGRAU may send their advance copy of applications directly within the stipulated date and send another copy through proper channel duly certified by Heads of Stations for the information submitted in the application. 9. Applicants should appear for interview, when called, at their own cost. 1965 and such other conditions as may be prescribed by the University from time to time. The University reserves the right not to fill all or any of the vacancies notified. Prescribed application forms together with full details of qualifications for the posts can be downloaded from the University Website (www.angrau.ac.in). the completed application form in all respects (5sets) along with payment of Rs.1000/- (Rs500/- for SC & ST candidates) through a crossed demand draft drawn on any nationalized bank in favour of COMPTROLLER, ANGRAU payable at GUNTUR should reach THE JOINT REGISTRAR, Acharya N.G.Ranga Agricultural University, Administrative Office, Lam, Guntur-522034, A.P. on or before 06.11.2017 by 4.00PM (by Hand/Registered Post/Speed Post). How to apply: The application duly filled and complete in all respects should reach the Joint Registrar, ANGRAU, Administrative Office: Lam, Guntur on or before 06.11.2017.